Cobia are a delicious, hard fighting fish that can be found both inshore and offshore, in deep water and shallow. During winter, pods of Cobia migrate along the shallow reefs, and beach, their dark coloration setting them apart from the sandy bottoms. These fish are often following big southern sting rays. It helps to spot rays from the tower and before casting live baits with 4 ounces of lead in front of the fish. Braided line on a a spinner with 80 pound leader is a great way to connect to these greedy fish. Cobia typically weigh between 10 and 50lbs, though larger individuals are not uncommon. In addition to following stingrays, cobia often follow big sharks, whale sharks, manta rays, and leatherback turtles. In addition, they can be found randomly swimming along the edge, usually as by catch while kite fishing off Miami for sailfish and tuna. Cobia will even intercept baits meant for snapper, grouper, and jacks while wreck fishing in Miami. Cobia fight very hard in deep water and go wild boat side when gaffed. Cobia have thick white fillets that are great on the barbecue or frying pan. 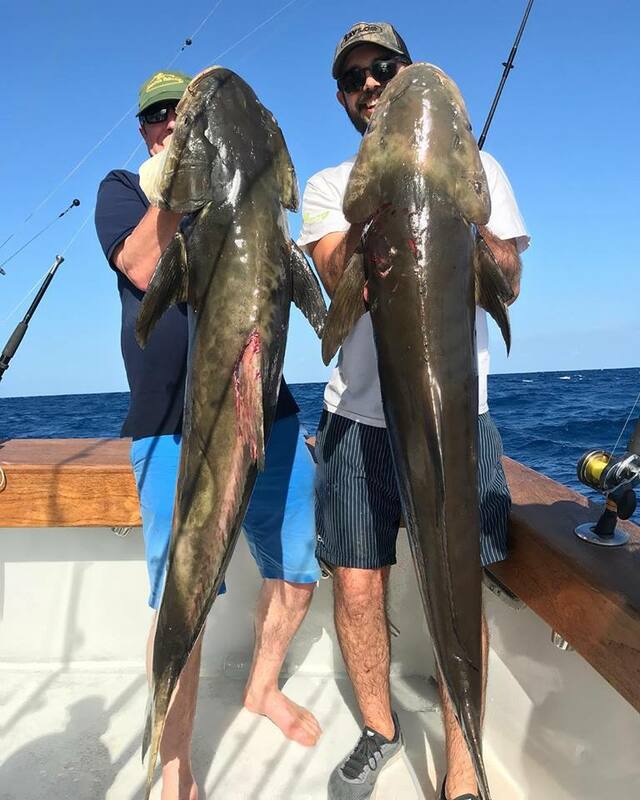 Cobia can be an unexpected addition to the cooler during our offshore fishing charters in Miami, but they are always welcome in the boat.